Golf is in a recumbent state here in Vermont, before the full hibernation begins in what is likely weeks rather than months. * In the chill season the Brattleboro Country Club is open only to members, and then only on the “old” nine holes, which takes some explaining. 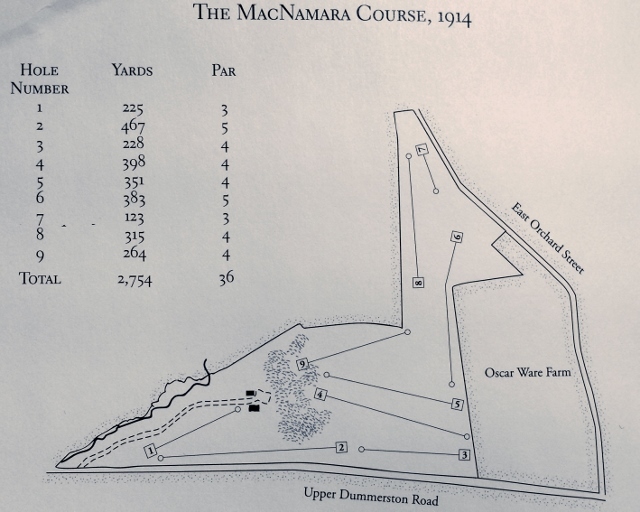 A nine-hole course designed by Tom McNamara of Boston opened for play on July 1, 1914, setting the stage for the club’s 100th Anniversary celebration next summer. Wayne Stiles redesigned the course in 1930, retaining one hole from the Bostonian’s routing, the first, a 200-yard plus par-3. When Steve Durkee’s design expanded the course to 18 holes in 2000 the first hole went out of rotation. But it has been preserved for practice, occasional use during charity tournaments for fund-raising challenges and for autumnal play on the Stiles’ nine. It’s a notion worth preserving; if McNamara is largely unknown today, he deserves more than a footnote in golf history. He was an expert playing professional, and he was instrumental in creating both the PGA of America and the PGA Championship. Born in Brookline, Massachusetts, November 18, 1882, McNamara came from good Irish golfing stock; his cousin, Willie McNamara, served as the first-ever professional at Lahinch in County Clare for thirty years. 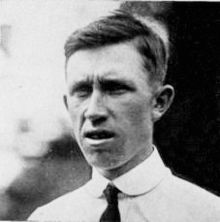 It was thought that McNamara might be the first “homebred” player to win the U.S. Open, dominated by players from the British Isles in the early years. But that was left to John McDermott in 1911. Yet it was the amateur Ouimet’s unlikely victory in 1913 that has been the stuff of legend ever since. As his contemporary Walter Hagen put it, “No one remembers who came in second.” Though an extremely skilled player with a variety of professional wins to his credit, McNamara was also something of the consummate bridesmaid, finishing second in three U.S. Opens (1909, 1912, 1915) and third in 1919, his last attempt. In 1915, he lost by a stroke, or the history books might be different. 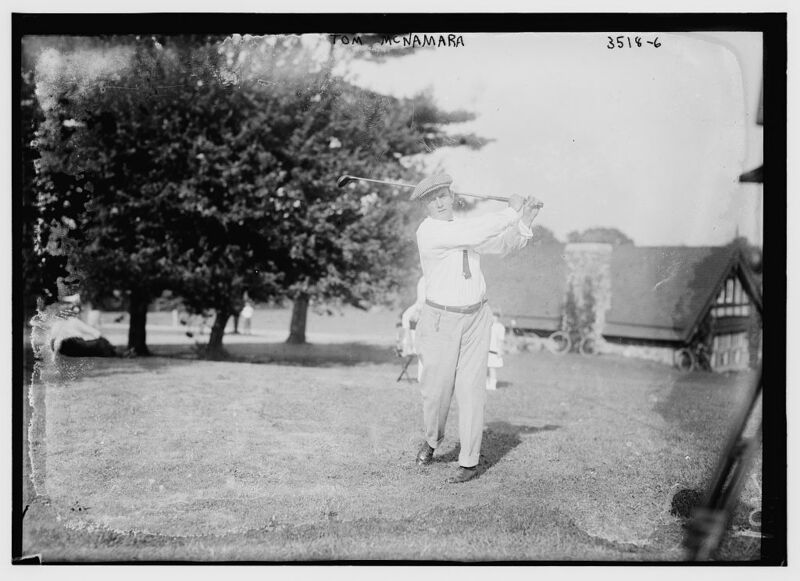 As it is, McNamara was the second player to record a sub-70 round in a major tournament in America, firing a 69 in the second round of the 1909 Open. (David Hunter beat him to it, recording a 68 in the same tournament’s first round.) Then he had the third, another 69, in the 1912 tilt. The life of a professional golfer was a far different experience 100 years ago than now. No one could afford to exist on tournament winnings alone. Since McNamara’s second-place in the 1915 U.S. Open was to amateur Jerry Travers, McNamara took home the first place prize—a whopping $300. McNamara was a club pro at a variety of courses (including Bellow Falls at one point), and obviously took on whatever golf-related jobs that might come along—like visiting Brattleboro in December of 1913 to lay out a nine-hole course. But he began working for Rodman Wanamaker, who was trying to take a run at the golf equipment business of A.G. Spalding & Brothers. By all accounts a gregarious and friendly sort, it was McNamara who arranged the meeting that Wanamaker suggested, bringing various pros and others in the trade to the Taplow Club in New York City in January of 1916. The meeting led to the formation of the Professional Golfers’ Association of America. Such an association needed a suitable tournament, McNamara told Wanamaker, and so the first PGA Championship was held at the Siwanoy Country Club in Bronxville, New York in October, 1916. The tournament was match play in those days, and McNamara was eliminated in the first round. Long Jim Barnes was the first to hoist the Wanamaker Trophy, still the coveted prize for what is now one of professional golf’s four men’s majors. McNamara began working for Wilson Sporting Goods in 1924, and stayed with them until felled by a fatal heart attack at 57, in Mount Vernon, New York on July 21, 1939, leaving behind a wife, five sons and a daughter. News of his death was received during the Western Open Championship, which McNamara had won in 1915. The flag at the Medinah Country Club was lowered to half-staff. As the Brattleboro Country Club’s 100th year began this past season the club took a look back by having club historian Robert Anderson give a tour of the original course. And it encouraged the curious to stride out to the antique first hole with old-style balls and a few hickory sticks in hand. Sand and a cup to form a sand tee was nearby to play the hole as it might have been a century ago—stymie rule in effect. The effort may be repeated next year, but in any case, it may do to remember that the first shot struck on July 1, 1914, was on the old first hole. And on July 1, 2014, a tip of the cap to Tom McNamara would not be out of order. *In somewhat different form this piece first appeared in the November 20, 2013 issue of The Commons, an independent non-profit weekly newspaper covering Brattleboro and the towns of Windham County, Vermont. My grand father was Tom McNamara I was very interested in this piece and I didn’t know he designed a course in Vermont. Thank you for writing this. Glad you found it, Mike. Do you remember your grandfather? Maybe you should come by sometime and we’ll play the old first hole he designed and have a chat about him. Thomas L. McNamara was my Grandfather. 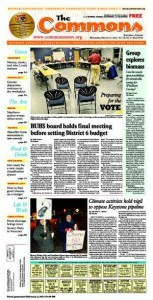 Loved your article on him and the Brattleboro course. I just returned from Ireland where I saw the Lahinch course, which is beautiful. My Grandfather past away before I was born but I vividly remember his brother, Dan, who was the caddymaster at the Country Club in Brookline, MA, and is described in the book The Greatest Game Ever Played, which chronicles the 1913 U.S. Open win by Francis Quimet..
Tom, Sorry I’m just running across this comment now! Thanks for getting in touch. Do you play?